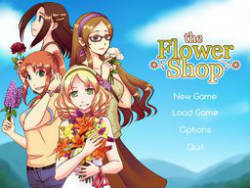 The Flower Shop is a dating and farming simulation game. Steve's life has just taken a downward turn. His grades from his first semester in college are dismal, his relationship with his girlfriend is rocky at best, and now his dad is shipping him off to some farm for the summer so that he can "build character." What's a poor, lazy, college kid to do? Take control of Steve as he spends a summer in Fairbook, working on the farm, making new friends, and maintaining old relationships.